When building a two-piece can factory, global companies base their choice of vacuum pumps on vast experience collected in their worldwide plants over decades. This long-term analysis results in selecting solutions with the lowest Life Cycle Cost. The typical vacuum needs for 2-piece can production are: continuous round-the-clock operation; minimal fluctuations of the vacuum level and a clean sucked media, all of which are quite simple if compared to cyclic evacuation processes with polluted media that occur in other applications. In a can plant, vacuum is as important as other energy forms, like electricity and pneumatic energy and without vacuum the production stops. As electrical power for the production lines, compressed air and vacuum are also crucial to keep up the production speed. The ongoing technological innovations in 2-piece can manufacturing allow nowadays high-speed production and better aesthetics of the cans using: embossing; special paint and unique shapes. Relatively few human resources are needed on the floor in a modern factory. Technicians must fine-tune various production steps, having no time to check on auxiliary equipment like pumps or compressors. Thus, the selection of these machines takes into consideration the total life span, as well as the operational, spare part and repair costs. Consequently, the purchasing price equates to a minor expense, less than 20% over a 10-year period. The primary goal is for trouble-free operation with continuous efficiency also after 100.000 hrs of operation and minimal maintenance needs. 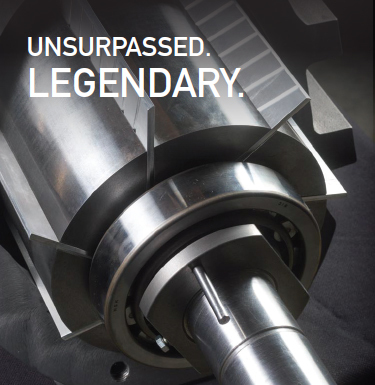 The delivery of the Pneumofore Rotary Vane vacuum pumps to the Ball Corporation dates back over 30 years. Some models have been specifically designed to satisfy the precise Ball specifications. 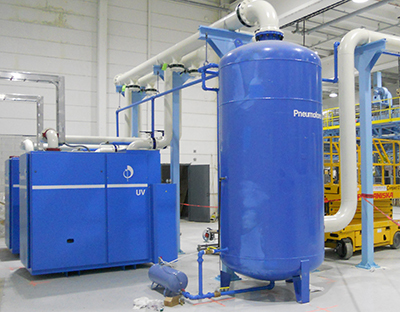 In the case of the vacuum pumps for the Mäntsälä plant built in 2013, the specs were impressive and mainly related to the units’ control. 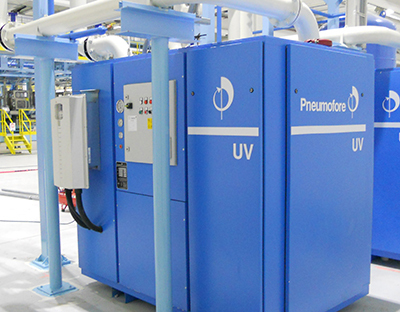 Air cooling was also a fundamental criteria, which Pneumofore satisfies even in higher climate countries up to 55 °C ambient temperature. In the Mäntsälä installation, the vacuum system is made of three UV30 vacuum pumps in the Variable Speed (VS) version. The heat recovery (HR) system allows to switch from air to water cooling depending on the warm water demand. 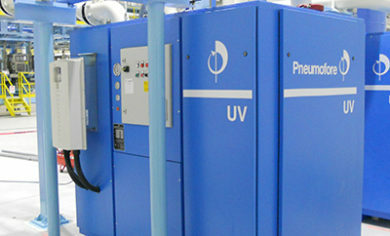 Yet, having bespoke air-cooled pumps, painted with the color requested by the customer, equipped with: a PLC connection; Variable Speed drives and combined with special motors is not enough to achieve the maximum power savings under all manufacturing circumstances. Of key importance are also the vacuum system calculations, which are supplied as a free-of-charge service by Pneumofore. 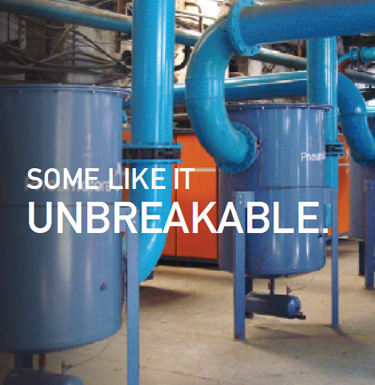 Pipe diameters, curve radius and distances must all be considered to avoid vacuum- or capacity losses. Frequently occurring are the installation of specific devices to avoid any liquid, solid or gas pollution entering the pumps. 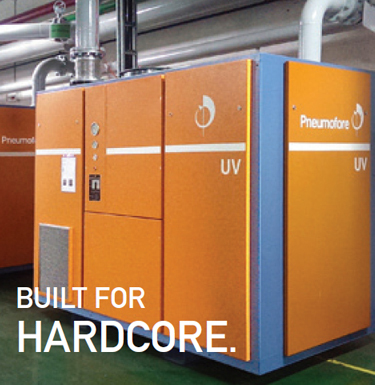 The ease of installation and operation of the UV vacuum pumps further contribute to the peace of mind of the production managers. Most notably, the core element of a Pneumofore machine is the mechanical Rotary Vane Air End which is not a consumable part and does not need replacement nor overhaul even after decades of use.